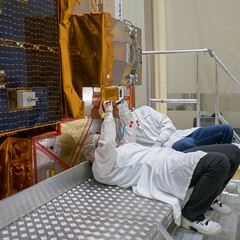 As Damiano mentioned in the previous MetOp blog, many of us are spending the summer in hot Baikonur. I can think of lots of worse places to spend the summer months. For one thing, Baikonur is sunny every day. It did rain one day last week – the first time in four months! 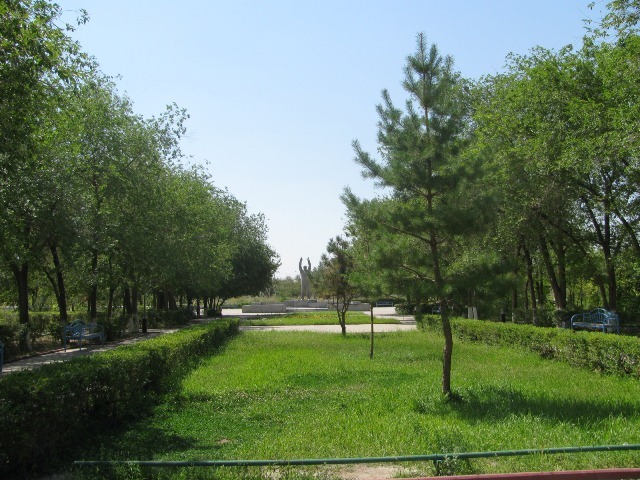 Although Baikonur is in the Kazakh steppe and the average rainfall in the summer months is low, the town itself is still amazingly green. Lots of trees and flowers have been planted around the town. Since we work six long days a week during the MetOp-B launch campaign, our one free day is much appreciated. On Sundays, the most popular activity among the MetOp teams is to cycle around Baikonur. Baikonur is relatively flat so even cycling in high temperatures is doable. Other ways of getting around are to use the local bus or a taxi. Basically any car in the town is a taxi. You can always try to stop a car on the streets and see if they are willing to take you to your destination for a small amount of money. 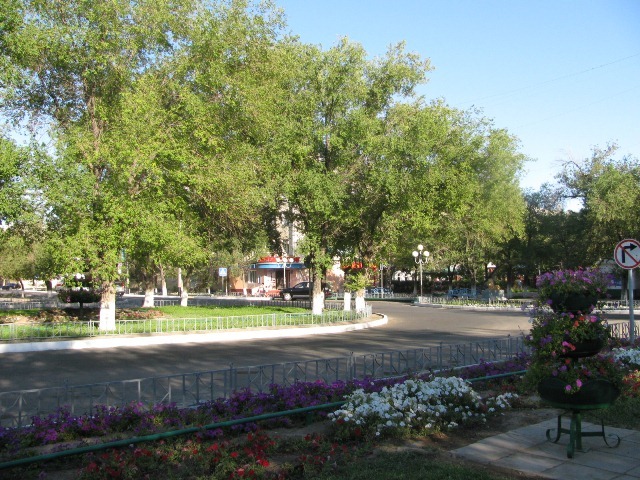 Baikonur can also be explored by foot since the distances are relatively short. One of the town’s main attractions is a market/bazaar. Here you can buy almost anything you can imagine: food, clothes, shoes, household supplies, pottery and souvenirs. Bargaining is customary, which can be a bit challenging since most of us only speak a few words of Russian. Other than the market, the town offers various other entertainment possibilities. There are ‘biergartens’, various restaurants, a bowling and entertainment centre, a tennis court and even a beach, but swimming is at your own risk! On Sunday afternoons the town is quiet, but after sunset local people gather on the pedestrian street ‘Arbat’. 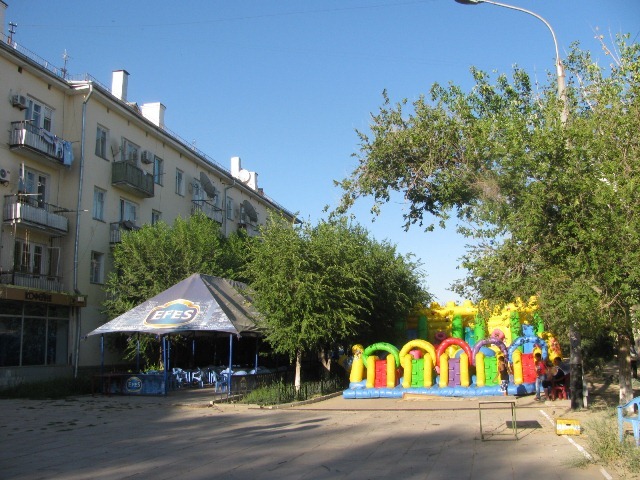 The children play on the street and the adults enjoy the slightly cooler evenings sitting and chatting on a bench or drinking a beer or Kvass (a drink made of rye bread) in one of the many Biergartens in Arbat. If would you rather spend your free day in a cool air-conditioned environment the best place is our hotel Sputnik. The day passes by working out in the gym, playing in the gaming room, watching a movie in the TV room or taking a swim in the pool. Afterwards you can enjoy a cold beer in the hotel bar before the dinner. The MetOp launch campaign weeks are long and busy, but at least our one free day every week can be spent almost as if we are on holiday. So spending summer in Baikonur is not that bad at all.